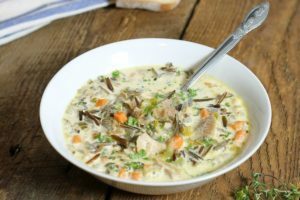 A hearty, leftover turkey soup, this recipe is loaded with delicious goodies, and I think, the easiest way to use up any leftover turkey meat in your fridge. 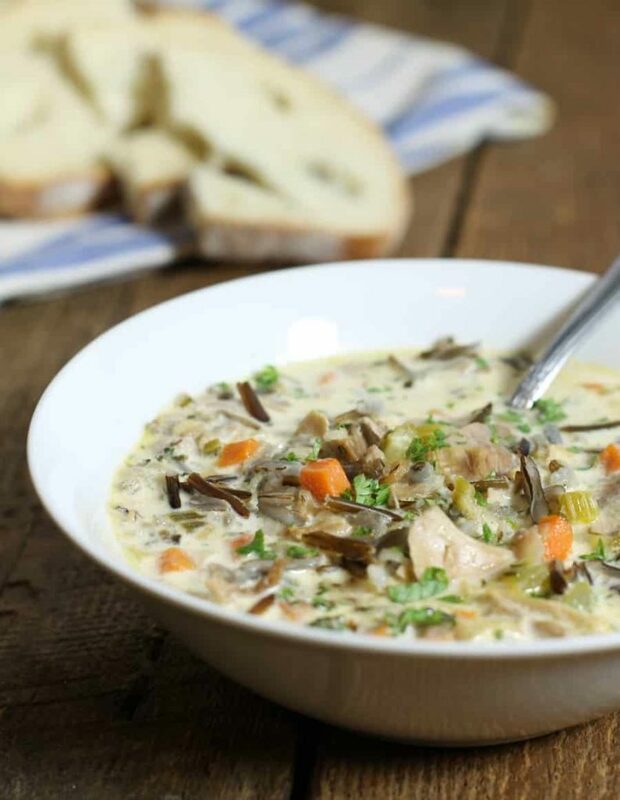 Using only one pot, this turkey and wild rice soup is a great way to avoid food waste, meal-prep, and eat healthy during one of the busiest times of the year! If you don’t have turkey, you can easily substitute chicken in this hearty soup. Everyone loves eating turkey over the holidays. Regardless of if it’s Thanksgiving or Christmas. It’s a time when families get together, cook way to much good food, and enjoy each others company. The thing is, everyone always has food leftover after the holidays! The best way to avoid wasting all that good food is to re-purpose it into new delicious recipes, such as this leftover turkey soup! You may be wondering, how do you make soup from leftover turkey or turkey carcasses? It’s surprisingly simple, and doesn’t take a whole lot of work. The easiest way to do it is to pick all the turkey meat of the carcass once everyone has had their fill, and make some stock out of the turkey bones. 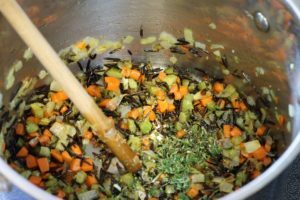 This provides a rich, (and nutritious) base from which you can make your turkey soup, and the meat you picked of the bones is saved, and will be added back into the turkey wild rice soup. You can also use the turkey meat to make turkey sandwiches, or both! You can make a turkey stock the traditional way on the stove top by simmering the bones in water for four to six hours, or you can make the stock in an Instant Pot, which allows you to set it and forget it. The Instant Pot does it’s thing for 2 hours, and presto! You have a delicious turkey stock to use in your leftover soup! 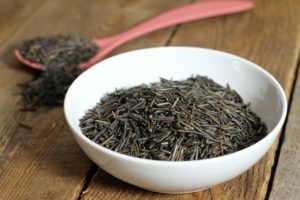 The wild rice can be cooked right in the soup, but dues to it’s long cooking time this means atleast 40 minutes of simmering (but oh man the flavor the soup will develop in that time!). 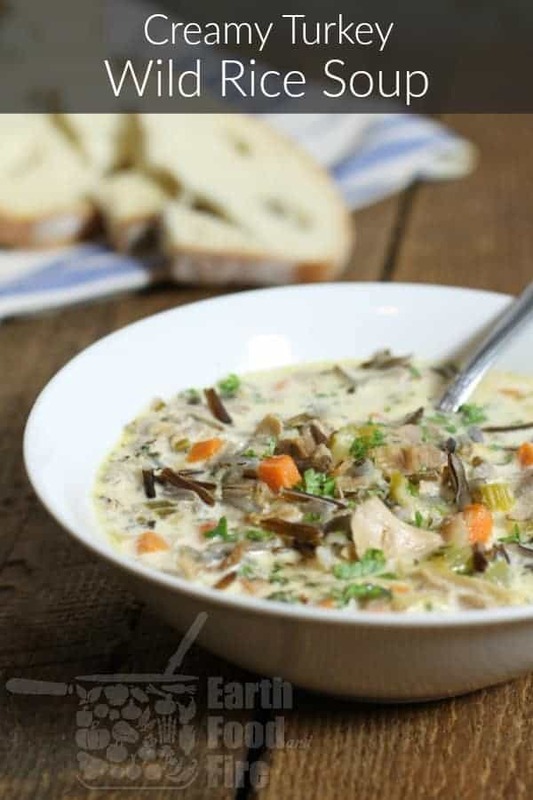 If you are short on time and need a faster end product you can use pre-cooked or leftover wild rice, which you simply add it to the recipe below after the soup has simmered and thickened. Start by preparing all your vegetables, they should be washed, peeled, and then diced. I like to small dice my vegetables for soup to keep them just a little bit smaller then the start of the show (the turkey), yet still prominent enough to be noticeable. Saute the vegetables in a little oil or clarified butter over medium high heat until they become translucent, and soft. It’s ok if the vegetables start to brown, it will simply add some color and flavor to the turkey soup! If you are using raw wild rice, add the rice to the pot now, along with the freshly chopped herbs, and garlic. If you are using up leftover wild rice, just add the herbs and garlic, the cooked rice will be added later. Toast the rice kernels in the pot for a minute or two to give them a bit more of a nutty flavor. Make sure to stir the pot as you do this to prevent the rice from burning to the bottom. Once the rice starts to stick to the bottom of the pot, de-glaze the pot with the white wine. This loosens any brown bits that may be stuck to the bottom, and adds even more flavor to your leftover turkey soup. Use a wooden spoon to scrape of any stubborn stuck on bits. Next add the turkey stock, and cream to the pot. Bring the pot to a boil by turning up the heat, and once it has boiled, turn the heat down to allow the soup to simmer. If you are using raw wild rice as I have in the pictures here, it needs a chance to cook. Simmer the soup for about 30 minutes to cook the rice most of the way before we add in the turkey meat. 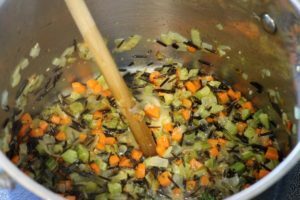 If you are not using raw wild rice, simply simmer the soup till the vegetables are cooked then proceed to the next step. Once the soup has simmered and the rice is mostly cooked (It will have a little bite left to it), it’s time to add the turkey meat. 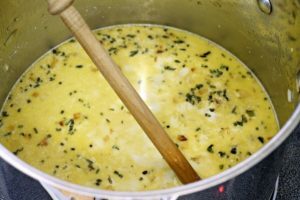 You’ll notice that the cream will have also thickened the soup a little at this point, giving it a nice rich, creamy texture. Add the chopped leftover turkey meat to the soup, and season the soup with salt and pepper. 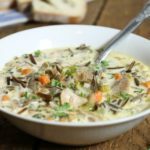 Note: If you are using pre-cooked or leftover wild rice, add it to the soup now with the turkey meat. Simmer the soup for another 10 to 15 minutes to finish cooking the rice, and heat up the turkey meat, and thicken the cream some more. 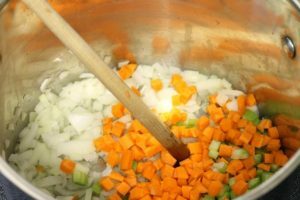 If you find the soup is till to thin, you can use a flour or corn starch slurry to lightly thicken it. Start by preparing all your vegetables, they should be washed, peeled, and then diced. Saute the vegetables in a little oil or clarified butter over medium high heat until they become translucent, and soft. If you are using raw wild rice, add the rice to the pot now, along with the freshly chopped herbs, and garlic. Toast the rice kernels in the pot for a minute or two to give them a bit more of a nutty flavor. If you are using up leftover wild rice, just add the herbs and garlic, the cooked rice will be added in step 7. Once the rice starts to stick to the bottom of the pot, de-glaze the pot with the white wine. Use a wooden spoon to scrape of any stubborn stuck on bits. Next add the turkey stock, and cream to the pot. Bring the pot to a boil by turning up the heat, and once it has boiled, turn the heat down to allow the soup to simmer. Simmer the soup for about 30 minutes to cook the rice most of the way before adding in the turkey meat. If you are not using raw wild rice, simply simmer the soup till the vegetables are cooked then proceed to the next step. Add the chopped leftover turkey meat to the soup, and season the soup with salt and pepper. If using pre cooked wild rice, add it now. We love leftovers made into soup at our house. Thanks for adding another great recipe to the mix! This is definitely happening this year. Glad to hear it! I hate seeing food go to waste, so this was a great way to use up some leftover turkey! It’s cold and windy here today, so this cozy bowl of soup would hit the spot! And you gotta love a delicious way to use up leftover turkey! Fall came way to quick! I do love this time of year though, hearty soups, lots of yummy baked goods! So much deliciousness! I almost look forward more to the turkey soup than the turkey itself! This looks delicious, I need to try it with rice!. What a great way to avoid waste and make a delicious, wholesome meal! 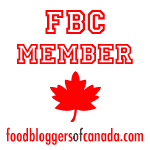 This soup allows you to savour the memories of your holiday dinner, too! Pinning.